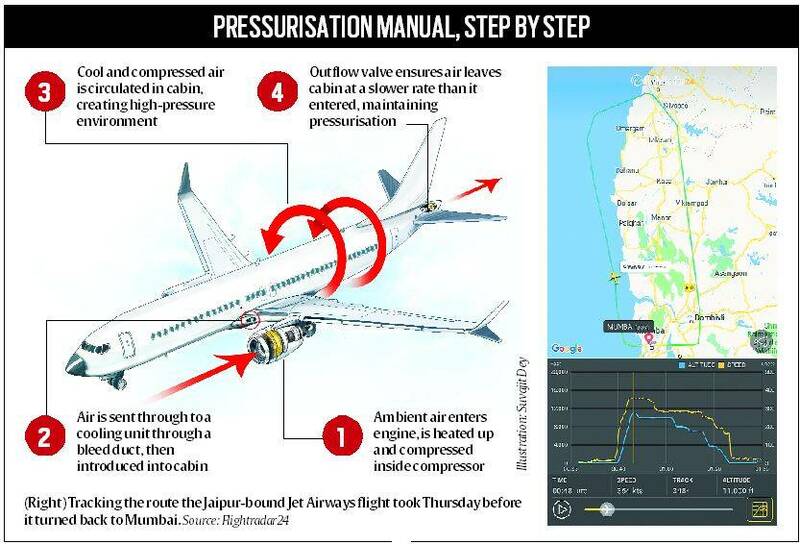 According to senior officials of the Directorate General of Civil Aviation (DGCA), the crew on Jet Airways flight (9W 697) forgot to turn on the ‘bleed switch’, which keeps the air pressure level inside the cabin at a comfortable level after the aircraft gains height. At least 30 passengers, including an infant, suffered nose bleeding, chest pain and other medical complications following an alleged manual error in maintaining the cabin air pressure on a Jet Airways flight from Mumbai to Jaipur on Thursday morning. As the flight returned to Mumbai, five passengers were taken to Nanavati Hospital after they complained of serious pain. Pilots usually shut off the ‘bleed switch’ button during take-off to gain thrust, and are required to switch it back on when they have climbed 500-1000 feet. According to the airline’s statement, the “flight’s cockpit crew has been taken off scheduled duties pending investigation”. The Ministry of Civil Aviation has ordered a probe into the incident by the Aircraft Accident Investigation Bureau (AAIB). The Jet Airways flight reportedly took off from Mumbai at 6.05 am. Within 20 minutes, passengers complained of pain in the shoulders, ears and breathlessness. As the air pressure level dropped, oxygen masks dropped down from the overhead compartment, said passengers, adding that no announcement was made by the cabin crew. Passengers had to wear the oxygen mask as crew did not maintain cabin pressure. Ankur Kala (38), one of the five passengers who was taken to Nanavati Hospital, said his oxygen mask was filled with blood after his nose started to bleed. “But the air hostess neither came to me immediately, nor allowed me to get up. There was extreme pressure on my ears. The crew members seemed scared, not sure what protocol to follow,” he told The Indian Express. Kala said that when the cabin pressure dropped, a woman passenger rushed towards the air hostess. “The air hostess said we are landing, and asked her to sit down. Until then, we didn’t even know we were returning to Mumbai,” he said. He claimed that he held both hands pressed on his ears as his nose started to bleed. “I had chest pain, could not hear anything. I passed out for 15 seconds or so,” he said. “What surprised us was that there was no announcement or even a sign to put the seat belt on. There was panic because the cabin crew looked clueless when the oxygen masks fell,” said Amit Relan (36), another passenger. The passengers alleged that they were not offered food or water for hours. Soon after the oxygen masks fell, a few passengers reportedly suffered nose bleeding. “A man in front of me was bleeding, another woman in the adjacent row suffered a nose bleed. A passenger behind me had difficulty in hearing,” said Relan. Satish Nair, a Vashi resident who was also on the flight, said his shoulders drooped and he sensed a blackout 10 minutes after the flight took off. “As I continued to feel restless, the oxygen masks dropped down, causing alarm among the passengers. We had no one to look to, as the airline crew looked equally confused. It was only after some scared passengers asked how to use the masks that the pilot announced that we were required to wear it,” he said. Nair complained of lack of training among the crew, saying they delayed in informing passengers about the problem regarding cabin pressure. “It was only after we neared Mumbai airport that the air pressure level was restored. After we landed, the air-conditioner started working and we could breathe easily. After landing, the pilot announced that there were issues with pressurisation inside the cabin,” he said. The flight landed at the Mumbai airport at 7.15 am. Thirty of the 166 passengers, including an infant, required medical aid. Passengers also complained of lack of medical facilities at the airport, saying that only one medical van was there to take them to the terminal building. The airline arranged an alternate flight at 10.30 am for the passengers to go to Jaipur. The passengers alleged that they were not offered food or water for hours. “My brother has been advised not to travel for seven days. Doctors said there was a lot of pressure on his ear drums. We wonder how and why other passengers were taken on the next flight to Jaipur despite nose bleed,” said Ankur Kala’s brother, Vikram. Dr Rajendra Patankar, chief operating officer, Nanavati Hospital, said all five passengers were treated as ‘out patients’. They underwent blood pressure check, 2D echo and audiometry tests, he said. “We gave them antibiotics and medication to stabilise their breathing. All of them are stable. They suffered from Baro-otitis in ear due to change in air pressure,” said ENT consultant Dr Amol Patil. Following Thursday’s incident, Civil Aviation Minister Suresh Prabhu has directed DGCA officials to prepare a safety audit plan which would assess safety parameters of all scheduled airlines, aerodromes and flight training schools. The report is to be submitted within 30 days. Meanwhile, Additional Commissioner of Police, West region, Manoj Kumar Sharma said that no complaint had been filed by the passengers or the DGCA.